A provocative series on the 2003 disappearance of two Labrador canoeists. SUMMIT OF ALL FEARS – Susan Barnes and Daniel Pauzé at the summit of Mt. Caubvick August 11, 2003. Shortly after these photos were taken, a series of tragic events would unfold taking the lives of both. The left photo is a self-portrait with Susan on the left. The right photo of Susan was taken by Daniel. These photos are from the digital camera recovered by the rescue party a year after they perished in the treacherous Torngat range. The closure took exactly one year. For a long, cold and lonely winter, the remains of outdoor adventurers Daniel Pauzé and Susan Barnes lay trapped in their Torngat tomb, victims of an August 2003 climbing accident. This past August, two groups of searchers, one private, one public resumed looking for the missing pair. Bad weather last year hampered any attempts to find them. In a superb piece of reporting and wonderful Web journalism, Andrew Lavigne of Ottawa, a friend of the pair and a member of the 18-person search team has put together a first rate Web site on the Dan and Susan story. 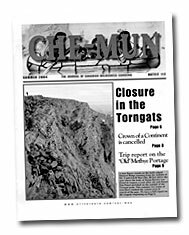 His excellent, and lengthy, report which features full stories, photos, maps and even GPS co-ordinates can be found at Lavigne's Tales from the Torngats. Andrew has kindly allowed us to quote from his site as well as us two of his photos. A memorial service was held in Brampton, Ontario in October of 2003. As everyone searched for answers, the idea of a privately-mounted search expedition took shape. This was partly driven by the fact that the authorities appeared to lack conviction regarding further searching. Both Jack Bennett and Roland toyed with and started planning just such an expedition, eventually combining their efforts into a single venture. 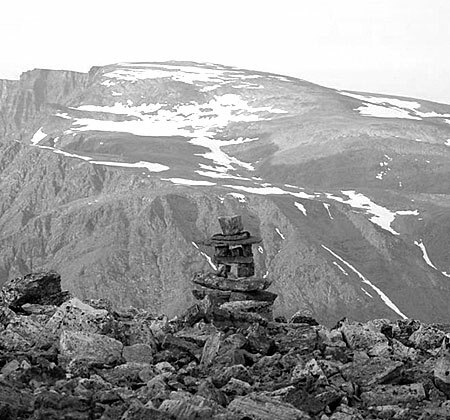 The expedition gradually took shape: an 18-member team, all volunteers, led by Jack and Roland, would return to the Torngats in August of 2004 to look for Sue and Dan. Also among the searchers were the Colorado couple that had been the last to see Dan and Sue alive. There were no guarantees: everyone had to be prepared for the possibility that not a trace of them would be found. There was word of bad weather and unusually heavy snows this year, so the team was prepared for the worst. The foot of Daniel Pauzé on the summit of Mt. Caubvick/Mt. d'Iberville, taken by the climber as he and Susan Barnes reached the peak on a stormy day in August 2003. This photo was recovered from their camera. After hundreds of hours of planning, the private expedition was ready to go. 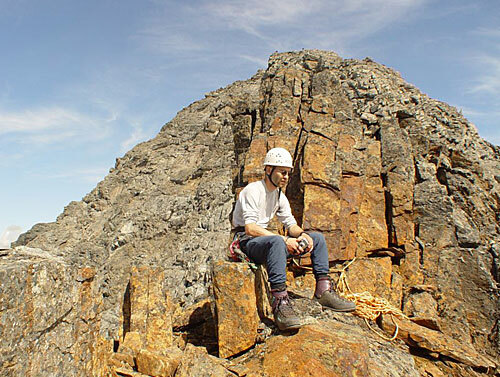 Leaving on August 3, 2004, the team received some basic Search and Rescue training, then headed up to scour the peak. The attack was multi-pronged: 9 team members would approach and search from the north, and 9 from the south. Teams were linked by satellite phone and radios to each other and to Parks Canada, who, although not absolutely committed, were still thinking of search the area again themselves. 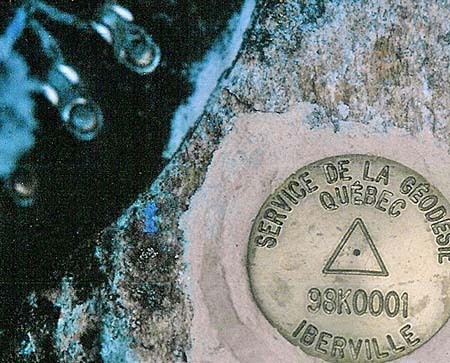 In fact, RCMP had first authorized, then cancelled, then re-authorized the Parks Canada team, such that it looked like the private expedition would indeed be the first to search the upper mountain. All went according to plan. What was reported as excessive snow cover turned out to be false - there was little snow on the mountain. On Saturday, August 7, the south team split up into 3 parties and simul-climbed the three southern approaches. 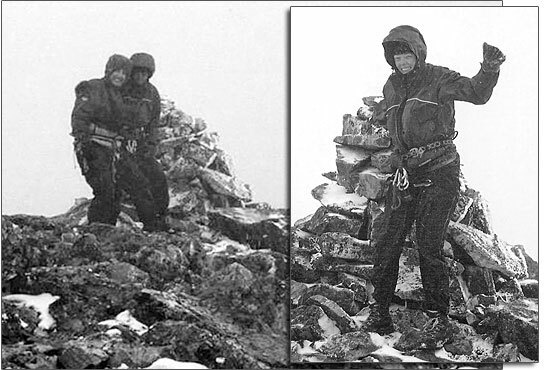 The most important and likely places to search were (a) the location where the harness was found, (b) the summit, and (c) the so-called "Koroc Step", a more difficult section along the mostly likely ascent route Dan and Sue used. By roughly mid-morning, the Koroc ridge search team was perhaps 45 minutes away from the first major point of interest, the Koroc Step. Parks Canada finally managed to make it in, and with their AS 350 helicopter, raced in to examine the upper mountain and the Koroc step. It was there hovering above the notch, that Dan was found, lying on his stomach, with one leg crossed over the other. He was directly on the ridgecrest in the step, partly in Quebec, and partly in Labrador. Shortly thereafter, descending the Koroc Ridge, something happened - likely Dan was climbing back up the Koroc step when some part of their rope system failed, causing Dan to be injured. Not able to move, and in worsening weather, they both knew Sue had to go for help. She couldn't take the most direct way down, because that involved climbing the 30 foot step of rock that their rope had just fallen off of. Instead she had to climb back over the summit and over a different, almost as treacherous knife-edged ridge of slippery, snow-dusted rock. It would have taken a lot of bravery and courage to do this by herself, testimony to her determination and love for Dan. The fact that Sue had not climbed much in her life, and certainly never in such conditions ever before, makes it all the more amazing. At the end of the knife-edged ridge, she reached the upper football field of level ground, and left her harness behind on the ground. From there she crossed the field and was looking for some sort of way down when she either fell, was blown off or downclimbed to the spot where she was found on the Minaret glacier headwall. The day after Dan was found, Roland sat down on a boulder in the Koroc step next to a water bottle that marked where Dan's body had lain for exactly one year. The day was sunny, warm, and there was not a breath of wind. There was a haunted and contemplative look in his eyes, as he tried to make sense of what had happened here a year before to his best friend, in the driving snow and fierce wind. Later, near the cairn above the spot where Susan was found, Roland inched forward on his stomach to the cliff's edge and surveyed the ledge directly below, where Susan would have spent her last moments alive. He lay there, still, for many minutes. Then, after some quiet, gentle sobbing, Roland stood up, regained his composure, and continued on down the mountain. The cairn above the spot where Susan was found.